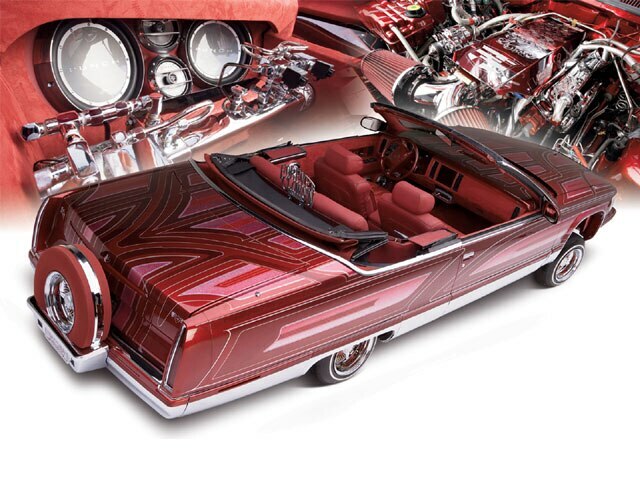 "Eazy" dealt himself a winning hand when he put together this custom convertible Cadillac. Growing up in Long Beach, California, Ezequiel “Eazy” Garcia owned several cars but none that come close to his latest creation. As the owner of Precision Engraving in Irving, Texas, Eazy contributed to several cars in the industry, but never really had the chance to work on a vehicle for himself. Eazy finally made time after seeing one of “Topo’s” custom Cadillacs from Mafia Customs in Artesia, California. The six-month project started off with Topo reinforcing the frame to make sure that the car would not collapse when he cut off the roof. Topo then took his time converting the car to a two-door creation, stretching doors and expanding quarter panels to proportion the car where needed. He then installed the retractable convertible frame and molded the third brake light, hood and dash. 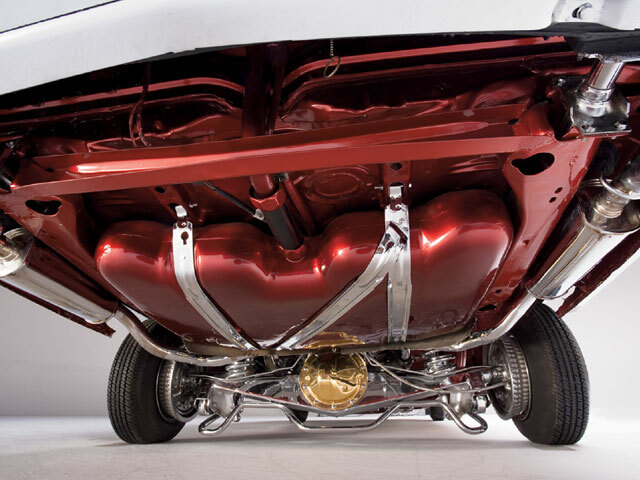 With the frame and undercarriage painted, Topo sent out the undercarriage and suspension to be chrome plated by Caesar’s Chrome Plating in Wilmington, California. Topo called in a favor and the body was sent over to Alex (or “Levi” as some of us know him) at Liquid Blue Prints in Lynwood, California. Alex laid out the intricate patterns, using up several rolls of masking tape and paper on the convertible. Alex used all of his tricks, including water drops and pinstriping by Curly’s Pinstriping in Long Beach, California. With all of the paint out of the way, Topo concentrated on putting the car back together. The stock 350 LT2 engine was dressed up with chrome and paint. Hydraulics were next on the schedule and a custom Homies setup was installed. The sound system installed at Mobile Connections in Long Beach includes a high-tech retractable amp rack that hosts the Rockford Fosgate amplifiers that power the 12-inch woofers. A custom 10-inch monitor was incorporated into the factory dash. With most of the car put back together, it was a downhill journey and a race to the finish line to complete the car in time for the Las Vegas Super Show. Eazy flew in two weeks before the show to help out in whatever way he could to meet the deadline. Body/Paint: “Topo” of Mafia Customs in Artesia, California, converted the four-door sedan to a two-door convertible, stretching doors and expanding quarter panels. He also molded the third brake light, hood and dash. Candy paint was applied by Alex of Liquid Blue Prints in Lynwood, California, using flakes and tricks that include water drops, with pinstriping by Curly’s Pinstriping in Long Beach, California. Interior: Billy Dobbs of Orange County used a vinyl and suede combination throughout the car and a Stayfast canvas convertible top to match the exterior.Sound System: Mobile Connections in Long Beach installed a JVC head unit, with a high-tech retractable amp rack that hosts Rockford Fosgate amplifiers powering 12-inch woofers. A custom 10-inch monitor was incorporated into the factory dash. Setup: A custom engraved two-pump, four-switch whammy setup was installed at Homies Hydraulics in Paramount, California. Six 31-series batteries were plumbed in stainless steel and polished to a show finish.